A breathtaking mix of elegance, style, and sophistication. Designed by Simon Frouws, these premium, luxury playing cards feature elegant gold foil hot stamped onto ultra-lux black paper derived from sustainable forests. Artisan have received rave reviews around the world. David Copperfield called them "the best playing cards ever produced." 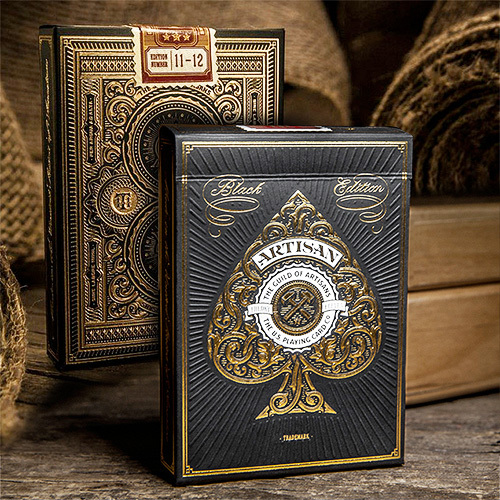 Artisan Playing Cards are produced at The United States Playing Card Company using FSC-certified papers derived from sustainable forests, vegetable-based inks and starch-based laminates. The result is a durable finish that respects the environment. • The deck is poker size. Αυτό το προϊόν προστέθηκε στον κατάλογό μας την Tuesday 02 February, 2016.